Before we get down to the dirty on this project allow me to provide a frame of reference as to why I designed this roll around cart the way that I did. 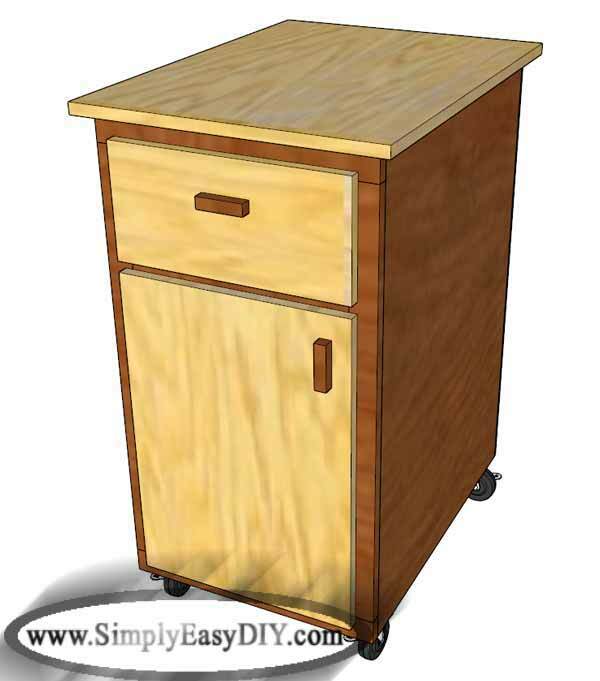 When it comes to shop projects I tend to gravitate toward an economical standpoint. How can I keep costs down but still produce something that is solid and useful? I first look to what I have on hand already. I rarely keep extra 3/4" plywood in my shop beyond what I need for whatever project I'm working on at the time. Since it is relatively expensive compared to other forms of lumber, I buy only what I need, when I need it. In my mind, 3/4" ply is just too expensive to make it a practical choice for many of my shop projects. I certainly am not going to go spend upwards of $50 just to make a shop project. Of course the quip I usually get from friends is "Why don't you just buy some MDF or OSB board?" My issues with those materials runs quite lengthy and would be more appropriate for a post all their own. 1/4" plywood on the other hand is relatively inexpensive. Less than $20 gets me a full 4' x 8' sheet of project board. Though space is tight in my shop I like to keep extra of this stuff laying around for just such projects. What else do I keep on hand? Well, usually some extra 2x4's and furring strips. Guess what I'll be using for this project. 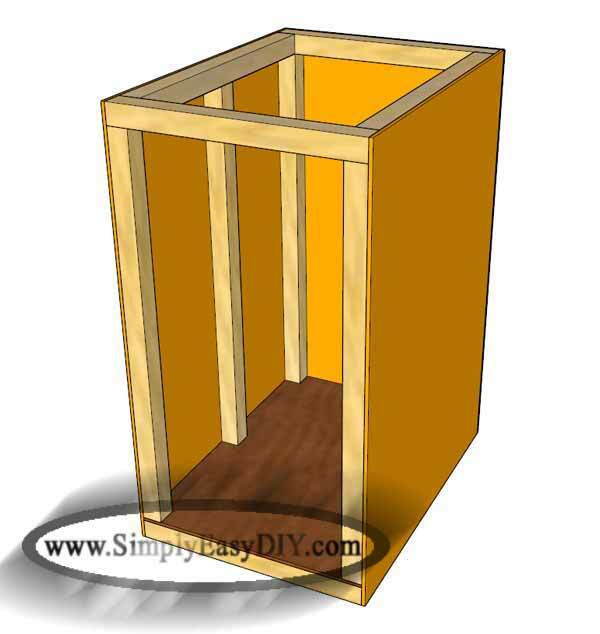 If you would like to see how I converted this shop cabinet into a fold down miter saw station check out my post here. 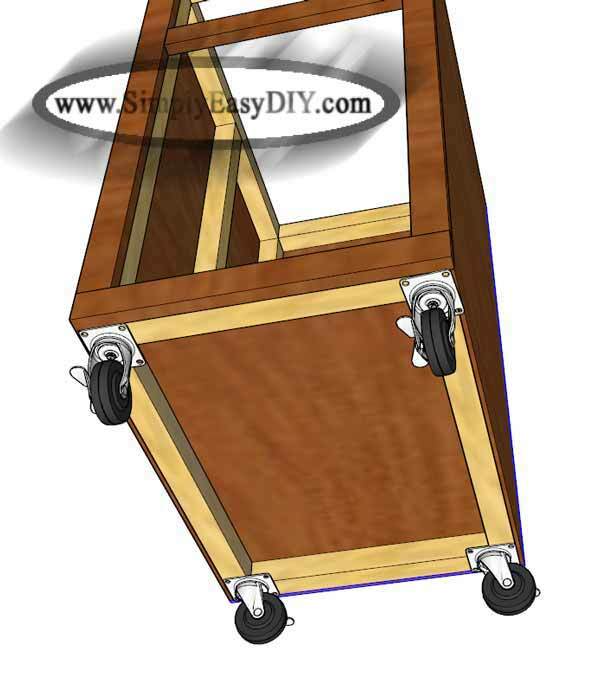 You can also check out the basic plans for the miter saw station here. 6 vertical structural pieces @ 29.5" x 1.5" x 1.5"
4 horizontal structural pieces @ 18" x 1.5" x 1.5"
4 horizontal structural pieces @ 21" x 1.5" x 1.5"
1 piece of 1/4" ply Bottom Panel @ 24" x 17.5"
2 pieces of 1/4" ply Side Panels @ 32.75" x 24"
1 piece of 1/4" ply Back Panel @ 32.75" x 18"
1 piece @ 14.5" x 1.75"
2 pieces @ 18" x 1.75"
2 pieces @ 29.25" x 1.75"
2 Side Pieces @ 12" x 5"
2 Side Pieces @ 24" x 5"
1 Drawer Bottom @ 24" x 12"
1 Drawer Front @ 15.5" x 7.5"
TIPS: The following measurements may be substituted. Use caution working with solid lumber wider than 1x6's. Especially soft woods such as pine. I find they show a greater propensity to warp, twist and cup. Gluing boards side by side, otherwise known as a glue up, will offer greater stability across the project. 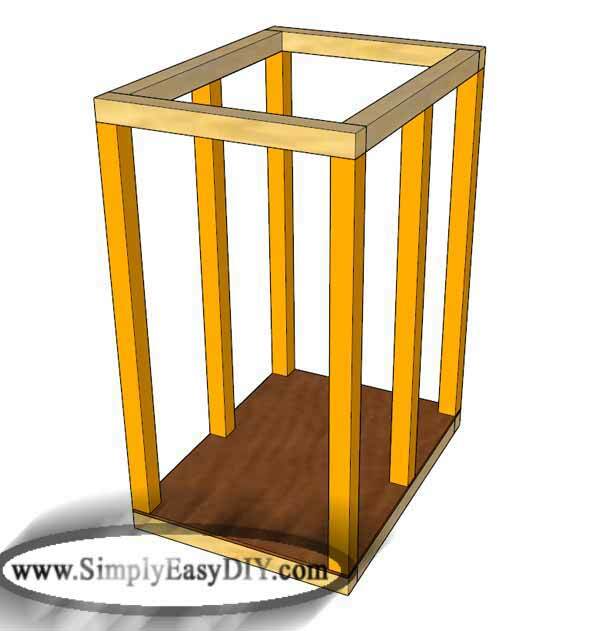 Assemble the top and bottom structural frames with 3" screws. No need for pocket holes. Just go in from the ends. Remember to predrill your holes so that you do not split the grain of the wood. It is very easy to do, especially at the ends of boards. Two screws per end for a total of 8 screws to secure the bottom frame and another 8 to secure the top frame. On the bottom structural frame only. 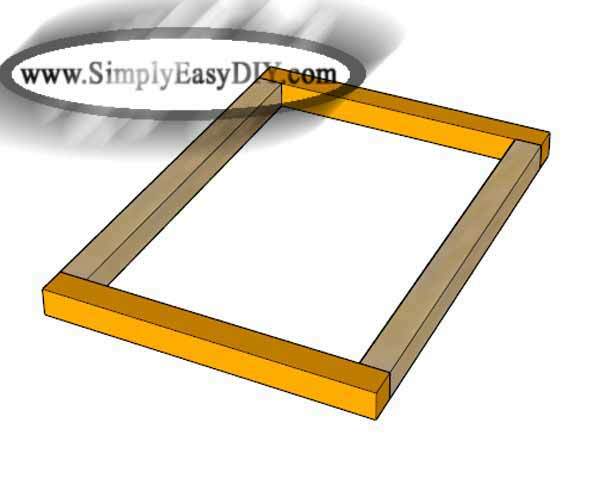 Tack a 1/4" piece of ply to the frame. again just from the ends. Attach the top and bottom frames to the vertical pieces. Predrill holes. Two for each vertical structure. Tack the quarter inch ply sides and back in place. The two sides pieces will sit flush with the front and back of the frames. 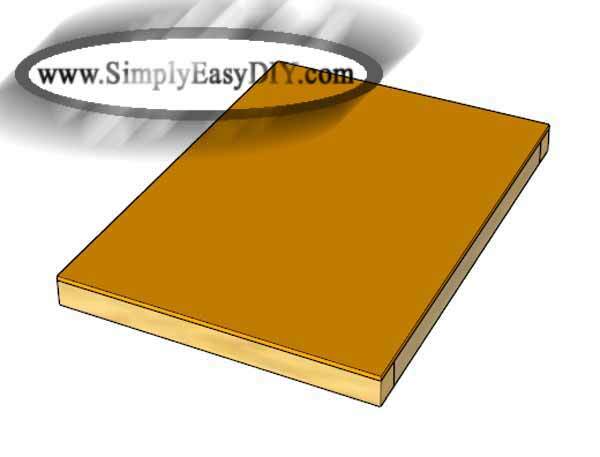 The 1/4" piece of ply for the back will flush up to the two sides. In other words attach the two side pieces first. Then attach the back panel otherwise a couple measurements will be off. Assemble the face frame. Pocket hole screws from the back is a reliable way to assemble face frames without additional joinery methods. I used furring strips ripped to width on the table saw. Keep the off cuts from these as they could be used to assemble the top for the cart as well the front for the drawer and the cabinet door. Time to assemble the drawer. For the sides I did dowel joints. A few other options would be some glue with 2" brad nails in from the sides or biscuits if you have a biscuit cutter. Of course pocket holes would work here as well. 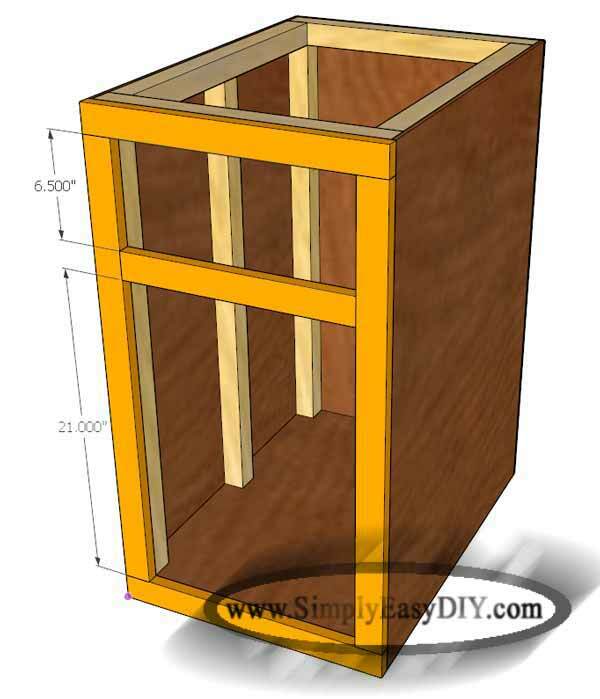 In this instance, because the bottom of the drawer is being attached to the bottom of the sides instead of routing dadoes on the inside of the sides, it will actually be supplying some structural support for the drawer. This in turn will take some pressure off the joinery for the sides. I glued and tacked the bottom in place using one inch narrow crown staples. 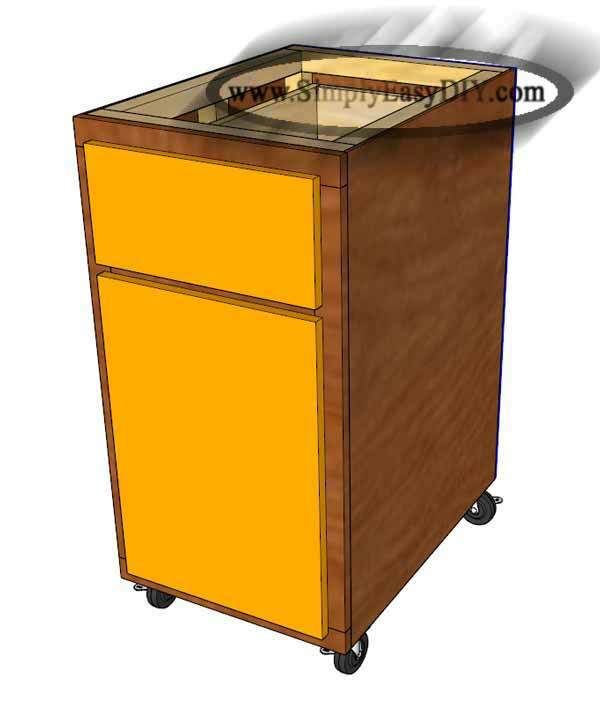 Before we attach the top, install the drawer and hang the door, flip the cart upside down and attach the casters. I used 3" swivel locking casters. Not the best quality but sufficient for a roll around shop cart this size and weight. Installation of the drawer can be done one of several ways. You can use store bought slides from your local home improvement store. You can also do what I did and build a couple L shaped guide rails out of scrape lumber. Attach them to the vertical frame pieces of the cart and apply some paste wax. You can then position the false front as you want and clamp it in place because the top has not been installed yet. Then a couple one and quarter inch screws from the inside of the drawer will keep the front in place. You may want to angle them in if you are concerned about punching through the other side. Now is a good time to go ahead and hang the door as well. I made a rail and stile type of door but simple 1x4 furring strips edge glued together and trimmed to size makes for a suitable shop door as well. Same goes for the false front for the drawer as well. In fact, we are going to use that same trick for the top, which is next. 1x4 furring strips edge glued together? Yep, how did you know? If your furring strips are exactly three and a half inches wide then six of them edge glued would make 21" Then trim one inch by running it through the table saw. You could also not fret over details that matter little and go with a 21" wide top. 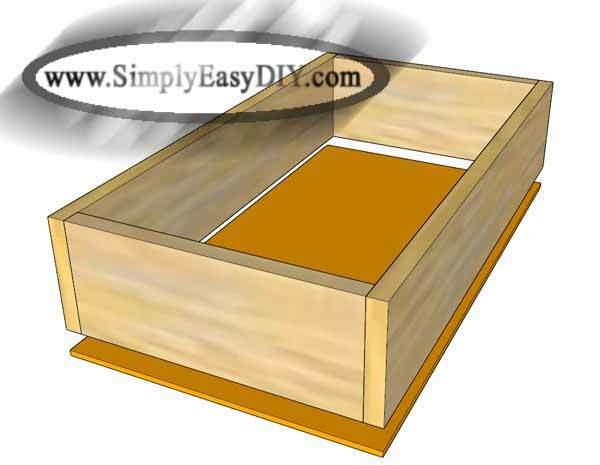 Some simple shop made drawer pulls for the drawer and door is easy to do. The materials I used for this shop project makes the cart light on its own. 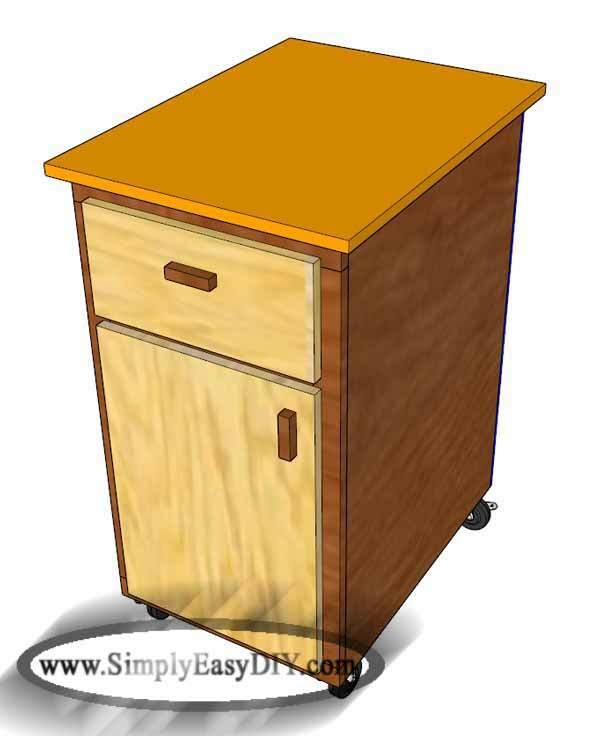 Which is good because cheap casters are not known to be extremely heavy lifters. The light weight of the cabinet will allow you to store just about anything you want in and on it without encountering a problem with its mobility. If you have any questions please don't hesitate to ask. Don't forget to visit my Youtube channel. Also, you can find me on Facebook and Pinterest as well. I just updated the post to reflect the info you asked about. Hope it helps. Thanks. Lots of people may just "know" that stuff, but I wasn't sure. I appreciate the time you've taken to share this info!